This rotating stand can hold anything from a cell phone, tablet or e-reader. Features a storage compartment on the back to hold paperclips, rubber bands and other small desk items. 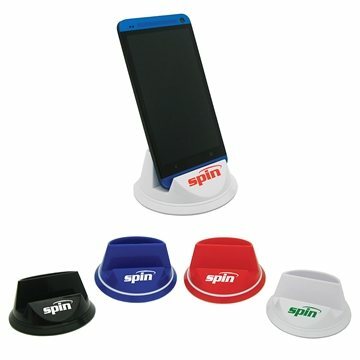 Ideal for promoting virtually any business, this handy device looks great whether on your countertop or office cubicle. A creative promotional product for web developers, fundraisers, tradeshows and consulting firms! Great product and excellent value. It will get our name out to many people so others can enjoy them. Rapidly done and incredibly good staff person to work with! the perfect place to do business. Thank you so much!! It was exactly what we ordered and exactly what I expected. the item was shipped very quickly and arrived in plenty of time for my function. I was very satisfied with the service and quality of the product and would highly recommend AnyPromo products. loved the vibrant color. We're above satisfied!